What happens when a movie maker looks to the Web to work around the traditional entertainment system in which he is one of the leading figures? Rob Burnett is the executive producer of "The Late Show with David Letterman" and CEO of the production company, Worldwide Pants Incorporated ("The Late Late Show with Craig Ferguson" and "Everybody Loves Raymond)." He and his writing partner Jon Beckerman were also the creators of the much admired "Ed" and "Knights of Prosperity." But, they decided the traditional Hollywood route was wrong for their new indie movie. "We wanted to let it find its right audience," says Burnett. So, they turned to the Web. Join us for a conversation with Rob Burnett about what they've learned as entertainment industry insiders trying to use the Web to let "We Made This Movie" find its audience. The conversation will be held with Elaine McMillion, David Weinberger, Jonathan Zittrain, and other special guests. 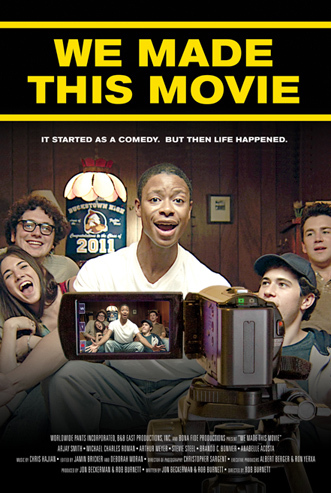 Afterwards, there will be a screening of "We Made This Movie," where five high school seniors set out to make a silly comedy movie, but accidentally end up making a dramatic and moving movie about their actual lives. All information on the We Made This Movie project can be found here: http://www.wemadethismovie.com. Rob Burnett is a five-time Emmy Award-winning executive producer of The Late Show with David Letterman. He is also president and chief executive officer of Letterman’s production company, Worldwide Pants Inc., where he oversees both The Late Show with David Letterman and The Late Late Show with Craig Ferguson. Elaine McMillion is an independent documentary storyteller based in Boston, Massachusetts. Her work focuses on contemporary social and cultural issues and strives to share stories from people and places that are often underrepresented or misrepresented by mainstream media. McMillion has directed and produced two award-winning feature-length documentary films and is currently in post-production of Hollow: An Interactive Documentary. Hollow, a cross-platform project supported by Tribeca Film Institute’s New Media fund, aims to communicate the personal narratives of post-industrial, rural America to inspire awareness and social change. He is the author of Small Pieces Loosely Joined and Everything Is Miscellaneous, and is the co-author of The Cluetrain Manifesto. His most recent book, Too Big to Know, about the Internet's effect on how and what we know.